No one ever got anywhere by not blowing their own trumpet, my old dad used to say (and it certainly didn’t get him anywhere. He was more a clarinet man). But on returning from a week in sunny southern France I found this on the Authors Electric blog, on the subject of Arthur Ransome, Robert Stevenson, and the business of mining writers of the past to bring something interesting to the present. It’s by my old mucker Dennis Hamley, and I haven’t asked him if I can use it. The other writer he cites is Julia Jones, who owns Arthur Ransome’s last boat, Peter Duck. There a link to the left to her outfit, Golden Duck Publishing. And her books are magic, believe me! I was in Blackwell’s in Oxford the other day and saw a book there which I knew I had to buy. Arthur Ransome’s Long-lost Study of Robert Louis Stevenson, edited by Kirsty Nichol Findlay, an academic from New Zealand who is obviously crackers about both of them, and published by the Boydell Press. How the study was lost and how it was found are both extraordinary stories on their own account. It wasn’t Ransome who did the losing. He was disillusioned with its progress, his publisher was suddenly very lukewarm and also he was just preparing to go to Russia, partly as a correspondent for the Manchester Guardian, more pressingly to get away from Ivy, his wife, because they were driving each other mad. So he cut his losses and left it to Ivy to post. That was a mistake. Though going to Russia wasn’t. Because here he found himself both as writer and sailor and here he met Evgenia, Trotsky’s secretary, married her and they had long and lovely lives together. Even though he never finished the book, the draft we have is still a delight. Ransome felt a great affinity for the older writer. And we can see the fruits of this in the great Swallows and Amazons series. The children’s imaginative world is fired by Stevenson – and especially Treasure Island. It’s a sort of royal line. The great storytelling tradition. Scott (thought I’ve never really been able to get on with him and besides, the narrative line started long, long before), Stevenson, Ransome. I often think about tradition in literature. As writers, we’re all in one, whether we like it or not. We’re all influenced by other writers. We can’t help it, however original and unique we set out to be. And when I look at Authors Electric, I see the successors in the Stevenson-Ransome sequence. I certainly rate Ransome, the summit of my early reading experience, as an influence. I can’t sail, more’s the pity (I can barely even swim), but for narrative flow and mastery of the plain style he has been my most important mentor. But there are two of our number who are strongly in the line of descent. First, Jan. A sailor, like Ransome, and, like me, a devourer of his books in childhood. 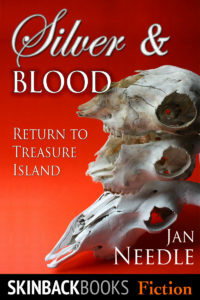 And a writer who, in Silver and Blood, has the measure of Stevenson’s achievement in Treasure Island. It’s not a sequel, nor just an update. More a homage, to both its writer and its main character, Long John Silver, who is not just a hard-hearted, treacherous pirate but a person of deep contradictions, huge subtlety, complex, appealing even in the act of evil, a constant riddling puzzle, almost a rougher version of Hamlet without the self-questioning. Jan nearly had a fit when I said I thought Moonfleet was the better book. I’m beginning to think I may have been wrong. And then there’s Julia. Her Strong Winds trilogy – The Salt-Stained Book, A Ravelled Flag and Ghosting Home are unashamed in showing their debt to Arthur Ransome. 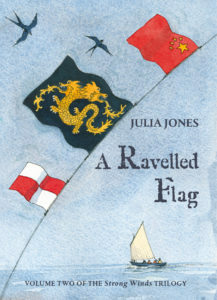 Ransome’s characters are constant role models for Julia’s. The imaginative worlds of Ransome and Stevenson are always there, under the surface – but these books are set in harsher times The crises are not make-believe or advanced forms of play. They are real, hard, stark and dangerous: they can kill. I’ve recently read them and now I’m reading them again to review (for Armadillo this time, not IEBR). So here are two writers who understand and acknowledge their debts. I think we all should. It’s good sometimes to pause and ask, not what we will write next, not how we will sell what we’ve just written, but WHO we are as writers. How do we fit in to the scheme of things? Where are our literary antecedents, our influences? Where are the springs and sources of our imagination? It’s a good exercise just to stand and stare for a few moments! Arthur Ransome: what a man. Jan, have you ever thought how his life parallels that of our dear old friend Jim Riordan. Like AR, Jim spent crucial years in Russia which shaped both their lives, like AR he married (in the end) a Russian woman. Like AR he wrote a lot of unforgettable books for children. How about doing a comparative literary study together? Does the internet make you mad? Discuss. I seem to spend so much time these days trying to find my way around the electronic world, I end up doing practically nothing. I’m about three quarters of the way through a huge and meaty thriller, and I have put pen to paper (so to speak) for so long I’ll have to read it all again to make sure where I’m up to. Likewise Facebook and Twitter and various blogs I read. I’m off to France in a few days time, and the book was meant to be finished. On the up side, I’ve heard some fantastic music. And made some of my own. Which I, at least, enjoyed!